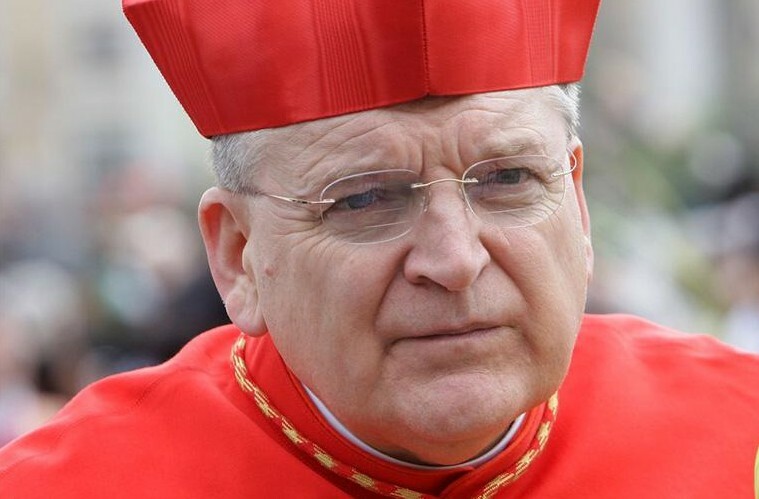 Here we go again – Fatima suffers another round of distortions and doubletalk, courtesy of Cardinal Raymond Burke’s May 19th speech at the Rome Life Forum. In established modernist style, it’s an intriguing blend of truth and novel errors. Rash euphoria greeted reports of his talk, entitled “The Secret of Fatima and a New Evangelization,” but sober analysis of his actual words reveal a disturbing picture. First, some background: the talk took place during the Jubilee Year of Fatima (November 27, 2016-November 26, 2017), a year featuring countless projects commemorating the Fatima Centennial. Now, as observed, in the special “Years” celebrated by the Holy See, the object being honored is simultaneously subjected to a revision and “updating” that weakens traditional beliefs and practices. For instance, in the Year of the Holy Spirit, my Archdiocese (Toronto) announced it would make the Sacrament of Confirmation more special by doing all Confirmations on the same day. This being physically impossible for the bishops, pastors were assigned to administer Confirmation. This was promoted as “upgrading” the Sacrament. Having been upgraded, it couldn’t be downgraded, and so Confirmation continues to be done by priests. The Year of the Rosary brought us the novel Luminous Mysteries and a new interpretation of the Rosary as a “Christocentric” instrument of ecumenism. Pope John Paul chose the syncretic Focolare sect to spread his Ecumenical Rosary for Peace, as it was called. The “Fatima Pope” also pushed for a replacement of the prayer which Our Lady of Fatima taught us to say after each decade. Because St. Paul “spent himself for the unity and harmony of all Christians,” the Year of St. Paul celebrated the great evangelist as an “ecumenist.” The papal basilica of St. Paul Outside-the-Walls in Rome was newly designated an “ecumenical basilica,” with one of its chapels dedicated to Protestant services. One could delve into other Years, but you get the point. Which brings us to the Year of Fatima. Sanctioned by the Holy See and emboldened by the convenient death of that great guardian of the true Message, Fr. Nicholas Gruner, a plethora of anti-“Fatimists” are exploding out of the woodwork with their own twists on Fatima. And so in this Year of Fatima, safe from his challenges, the anti-Fatimists are with impunity undoing Fr. Gruner’s “harm”. Naturally, Card. Burke’s speech doesn’t once mention or commend Fr. Gruner’s work. Instead, we find large sections devoted to upholding the programs and actions of “Saint John Paul II” and “Blessed Paul VI.” This adherence to arch-heretics reveals the orientation of the speech: Fatima as seen through the lens of Vatican II. It’s in this context that we look more deeply into the Cardinal’s sudden call for the Collegial Consecration of Russia to the Immaculate Heart of Mary. Is it a “vindication” of Fr. Gruner as some claim? Not so fast. This is doublethink – the holding of two opposing ideas at the same time. In Communist dialectical terms, it’s the synthesis of a thesis (Consecration not done) and antithesis (Consecration done). Perhaps the reason he feels obliged to repeat the Party Line that the 1984 Consecration was acceptable is because the alternative would constitute the “thoughtcrime” of holding that (a) incomplete “Consecrations,” even by “sainted” Popes, have been acts of disobedience towards Our Lady and the Holy Trinity Itself (present at Her 1929 request); (b) the faithful have been systematically deceived about their validity; and (c) Communism is not dead and the errors of Russia underpin the post-conciliar Church. Maybe John Paul’s creative take on Our Lady’s wishes was to excuse the fact that all previous and future incomplete Consecrations could not and would not bring about the promised conversion of Russia and world peace. In any case, various “Consecrations” to suit changing times fits the modernists’ policy of constantly re-interpreting everything, including Fatima. Directed toward the conversion of Russia to the Catholic Faith, Fatima has long been a stumbling block for ecumenist bishops and Popes who have “anathematized” proselytizing; further, they attributed the fake “death of Communism” at the Soviet Union’s controlled demolition to the “successful” (though invalid) 1984 Consecration. Which brings us to another major thrust of Card. Burke’s address: Fatima is intertwined with the “new evangelization.” This dialectical claim is a serious affront to Our Lady of Fatima. Let’s see why. The Cardinal is highly perturbed by the “poisonous fruits of the failure of the Church’s pastors.” (Is he excepting himself?) 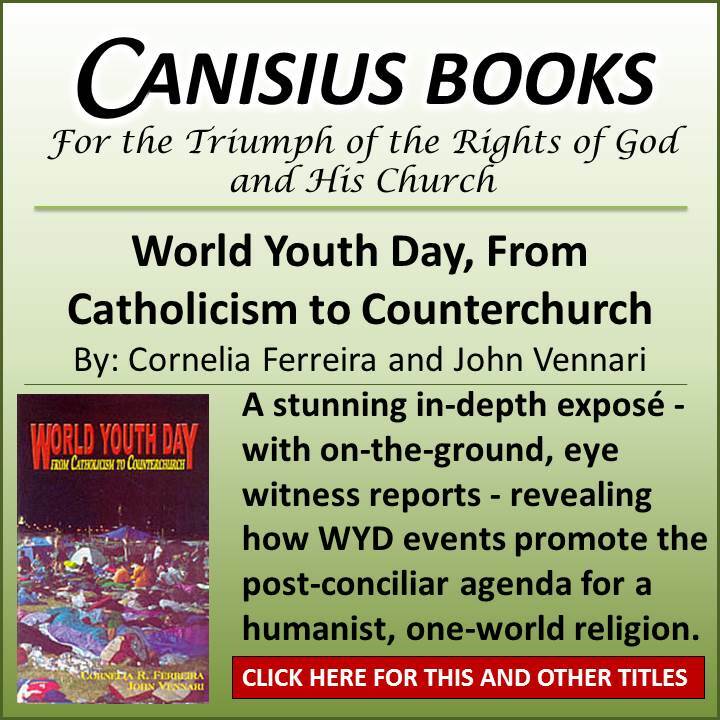 He connects the mess in the Church to Paul VI’s famous anthropological observation that “through some fissure” the smoke of Satan had entered the temple of God, and “darkness” and “uncertainty” was engulfing the Church after Vatican II. Of course, Paul VI didn’t link these problems to the Council (even blaming the devil and “secular prophets” for trying to “suffocate the fruits” of the Council), the Communist infiltration, or to John XXIII’s “opening the windows”. Now, before becoming Pope, Pius XII prophesied that the “persistence of [Our Lady of Fatima] about the dangers which menace the Church is a divine warning against the suicide of altering the Faith, in Her liturgy, Her theology and Her soul … A day will come … when the Church will doubt as Peter doubted”. This exactly describes the suicidal Council and its aftermath. For abandoning Tradition, the Church’s pastors were led into delusions and errors (what Sr. Lucia termed a “diabolical disorientation”) as a punishment of God (cf. 2 Thess. 2:7-14). Ah yes, they need to know there is no sin, no hell, Jesus loves them, and everyone is saved. The new evangelization is not re-evangelization, but a new way of “evangelizing.” This was made clear when, in 1985, John Paul emphasized, “the reference point for all contemporary evangelization must remain the Second Vatican Council” – not Christ’s command to teach “whatsoever I have taught you,” and baptize (i.e., convert) all men into His Catholic Church, outside of which there is no salvation. Instead, the new orientation of the Council, as proudly stated by one of its architects, Cardinal Ratzinger, in his book Theological Highlights of Vatican II, was non-conversion, i.e., non-evangelization. As Pope Benedict, in 2007, he reiterated this meaning of the “new evangelization” for the Latin American bishops. The new evangelization is opposed to conversion and salvation. New in its methodology and orientation, it’s instead effecting a dialectical synthesis between traditional and modernist thinking, gradually converting Catholics to the modernist, Masonic anti-Church of Vatican II. This doublethink is blasphemous – implying Our Lady wants to defy Her Son’s command to convert all nations, whilst painting such defiance as honoring both of Them. John Paul’s mantra – “civilization of love” – recycles the Sillonist ideal condemned by Pope St. Pius X. Culture reflects religious beliefs. The only way to destroy the culture of death is to convert the whole world to the true Catholic Faith. Showing Her Heart encircled with thorns, Our Lady said it was pierced by blasphemies and ingratitude. She gave Sr. Lucia the devotion of the Five First Saturdays to make reparation for these sins against Her and to console Her. Furthermore, although Fatima is supposed to be about establishing devotion to the Immaculate Heart, Card. Burke’s novel emphasis throughout is on the Sacred Heart (ecumenism again? ), even though devotion to the Sacred Heart had already been established through St. Margaret Mary Alacoque. Departing from the pure message of Fatima, Card. 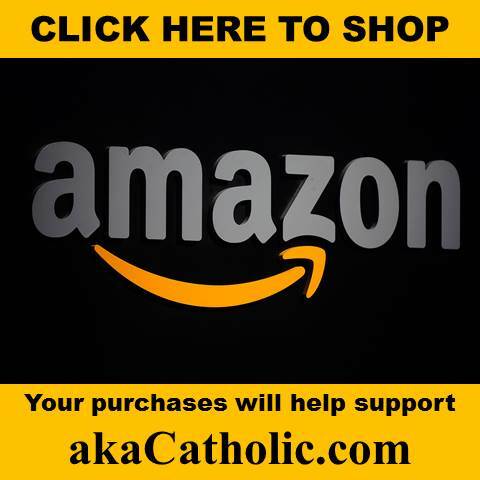 Burke seems to be endorsing more the work of the Alliance of the Two Hearts, part of the Alliance of the Holy Family International, which operates under the Vatican’s new Dicastery for Laity, the Family and Life. Formed in 1990 to foster holiness in the family, clergy, and marriage, their new devotion promotes consecration to the two Hearts jointly and a lifestyle termed “the Communion of Reparation.” This includes what the Cardinal requests: the Brown Scapular, daily Rosary, regular Mass attendance, confession, Eucharistic Adoration. Responding to Pope John Paul’s “challenge to make every family Eucharistic-centered and Marian,” the groups also hold a First Friday-First Saturday Communion of Reparation all-night vigil “for sins committed against the sanctity of family life”. Although these pious practices are commendable, they adulterate the authentic Message of Fatima by blending it with other devotions. Indeed, the Alliance recently brought a statue of Our Lady of Fatima blessed by Pope Francis to a parish here in Toronto. They led a consecration prayer to the Two Hearts, whilst preaching that Our Lady said consecration to Her Immaculate Heart was necessary to make reparation for offenses against the Sacred Heart – mirroring Card. Burke’s position. Finally, it’s highly disturbing to see that the Cardinal derives a lot of his information from a biography of Sr. Lucia published in English in 2015 by the Blue Army (now called the World Apostolate of Fatima, or WAF). Fr. Gruner spent his life heroically battling such outlandish misrepresentations of Fatima. The WAF heaved a collective sigh of relief when he conveniently died on April 29, 2015. He wouldn’t be around to challenge the Fatima Centenary projects that, according to the WAF branch in Goa, India, were already being hatched. Hang on – the schismatic Russian Orthodox are now part of the Catholic Church? And the ecumenical – i.e., sacrilegious – act of joining the Orthodox in consecrating Russia to the Immaculate Heart will represent the triumph of Her Heart? The mind reels at the doublethink. The decline in those Catholics able to recognize error continues. “Fatimists” who blithely think the Cardinal’s speech is a gain for their side have unfortunately been synthesized. It’s not a good place to be. Someone should send Cardinal Burke a five-pack of dubia. 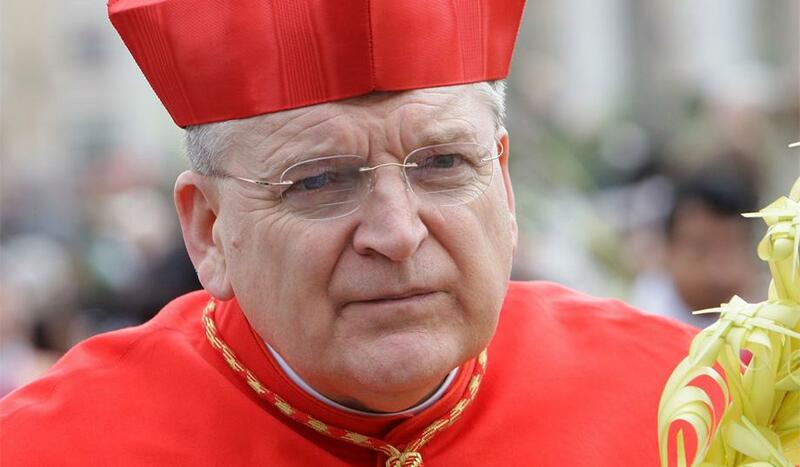 Yes, “Here we go again…” Another person poking at Cardinal Burke as he walks the tightrope…without a net. I’d sure like to have him around for the election of the next…uh, I mean election of a pope. How many faithful do we have in the hierarchy to represent traditional Catholicism? Four? Six? A dozen? Yes, let’s all go Lord of the Flies eating our own every time one of them says anything that isn’t 100% how we want it phrased. In all due respect tradprofessor did you even read the article: “How many faithful do we have in the hierarchy to represent traditional Catholicism? Four? Six? A dozen?” How about a BIG FAT ZERO which is what I think the article very clearly and succinctly points out, well, at least to the small amount of “rad” Catholics left that haven’t yet come to accept the blasphemous, scandalous (and “canonized”) mortal sins against the First Commandment as the “new normal” teaching of the Catholic Church in the same way their “heroic” dubia Cardinals have by falling for the red herring “smoke and water” show of Pope Francis and Amoris Laetitia. Well said. I’ve just come to tradition, and have stopped worrying about Francis and co. on my own. Also, abortion and the gay stuff. Not that those things are ok, but the red herrings and “smoky water” (haha) lead us away from he real problem, Vatican ii and that vomit endusing mass new mass. The real problem is that Russia has not been consecrated to the Immaculate Heart and things will only get worse until then whether we have the new mass or not. In hindsight we can see that there was a gradual decline under the past two Popes before Vatican II, and both of them failed to consecrated Russia properly. Pius XII brought in Bugnini let’s not forget. Tradprofessor: this has nothing at all to do with not being “100 % how we want it phrased” but about Cardinals, Bishops blatantly promoting diabolical and scandalous sins against the First Commandment while disenguously hiding that fact behind a well -publicized, but basically totally meaningless, battle with Pope Francis and Amoris Laetatia (the Sixth Commandment) It’s like they’re saying never mind us defending the First Commandment, (sadly, the Catholic Church being the ONLY CHURCH that can even defend it), that’s basically history with us because of our love for and “canonization” of VII. What a great smokescreen and instrument Amoris Laetatia has become to distract from the more serious errors of PJPII,VII and ecumenism. It’s amazing how many trads been duped by Pope Francis ( the now so-called handsdown worst Pope ever, now I know what “people have short memories” means). He’s not as stupid as some think. One last thing, Cardinal Burke has already fell off the tightrope unto the “net” of false ecumenism “or sins against the First Commandment” with every single one of the other bishops. I have no idea what people are talking about when they constantly talk about “Cardinal vs. Cardinal, Bishop vs. Bishop”, like I said when it comes to mocking the First Commandment they are all in the same big fat net together. Unfortunately, that’s why PJPII kicked Arch. LeFebvre out or really Arch. LeFebvre realized he wanted nothing to do with those in the “net.” Good for him and us. No offense tradprofessor, but your mentality is precisely the same one that is used to justify voting for Republican/Conservative candidates despite that they are pro-homosexual or pro-abortion because they need to walk a tightrope and they are the only thing standing between us and a Democrat/Liberal presidency. Now I get why people may vote that way as a desperate deterrent, but that doesn’t mean we should shut up about the fact that they are marching in the pride parades, or saying things like they feel aboriton is wrong, but they don’t want to interfere with a woman’s right to choose etc. It’s wrong for them, and it is still wrong for Cardinal Burke to use false premises to achieve a good end. Otherwise we may as well all throw in the towel and go along with the great ecumenistic project. The Novus Ordo establishment and those associated with it could never fully admit to recognizing the dire warnings of Our Lady of Fatima because She is pointing to the intrinsic errors of the pseudo -church they have invented. Why did Our Lady pinpoint the year 1960 as being crucial to Her message? What was about to happen in the Vatican at the request of Pope John 23? The dots are not that difficult to connect. Any sites that talk about the Fatima message without the editing of the novus ordo church? Cornelia, Thank you for this Labor of Love. Good job clearing away the fog. May the diabolical disorientation be lifted from those who love Our Lady. Bravo!! 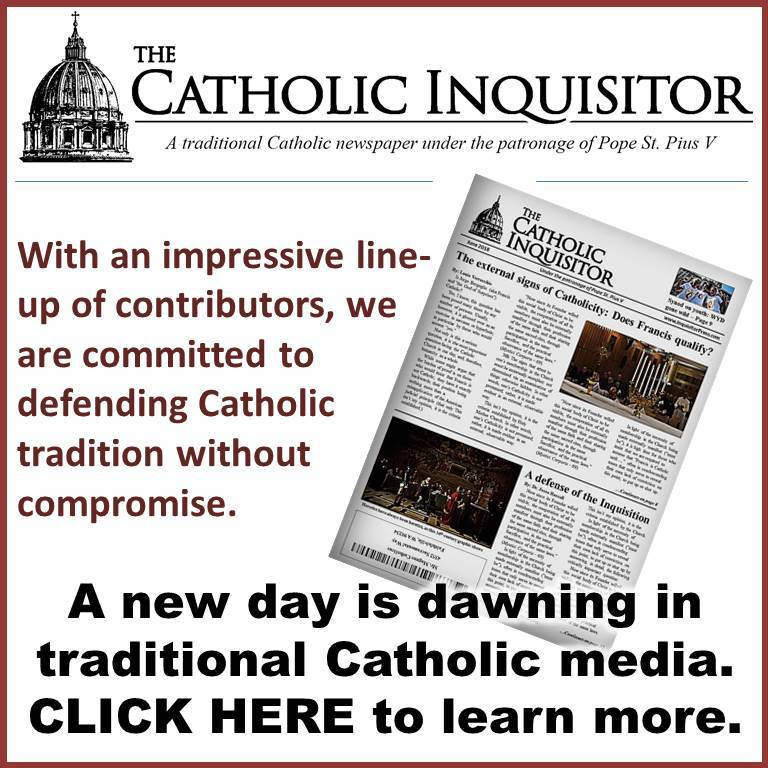 I’m so glad to finally read an article focusing on the problems in the Church that isn’t just “beating the dead horse” (“https://www.merriam-webster.com/dictionary/beat%20a%20dead%20horse) of Amoris Laetatia, the Dubia Cardinals or Pope Francis to the extreme point of not being able to “see the forest for the trees” anymore (“http://www.urbandictionary.com/define.php?term=can%27t%20see%20the%20forest%20for%20the%20trees) and even though I really can’t afford it now I’m donating $100 in memory of John Vennari, who I enjoyed reading along with his newspaper Catholic Family News. May he rest in peace. Amen. This is a phenomenal post, Cornelia R. Ferreira. Like a surgeon, you dissect this communist double speak for those of us who are still learning how to safely come out of the matrix and to clearly speak the language of the Holy Catholic Church. Funny that people could think they could sweep God’s Mother and her child, Fr. Gruner under the carpet. Reading this made me realize how humble and persecuted and hated Fr. Gruner still is. Obviously, his true devotion to his mother, Our Lady of Fatima, is still a threat to so many who will not clearly and straight forwardly speak or even regurgitate simply what Our Lady has said. It’s that simple…but I never hear them say it. Why are they embarrassed by their Mother? Do they even love Her? I mean really. Do they love Her? You gotta LOVE Her. And those of you who do, know it and are blessed! I tried posting this link on the Remnant Blog, but the moderator did not permit it. Louie, would you be able to convince Mr. Matt to feature this important article on his website or newspaper? I can understand “tradprofessor” but the fact is that the damage of these falsehoods are more dangerous when they come from seemingly good and gentle Churchmen, such as Cardinal Burke. The more Tradition al and Catholic the source, the more damage they can do when they lie or spread error. Cornelia is to be congratulated for such a well written article and for her courage to speak the truth, even when that truth is uncomfortable to hear. I appreciate Louie for allowing differing viewpoints to be discussed on his page. Others seem to be threatened by opinions that differ from their own, for whatever reason or the other. This also seems to be the most respectful group I have ever come across. 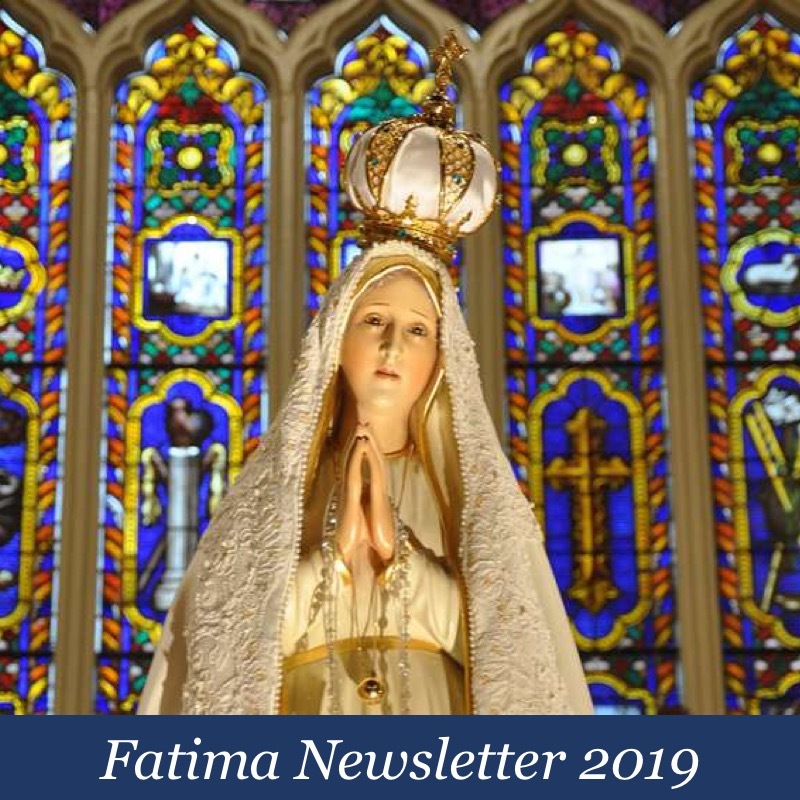 What is your opinion of the “third secret of Fatima” posted on Tradition in Action by Atila S. Guimarães and Marian T. Horvat, Ph.D. just two months ago? …. and concluded that it …. They think they found the real third secret of Fatima. It is really amazing. Interesting to note that not only is the evil one is referred to as ‘Pope’ (with quotes), but the Virgin did not refer to JPII as Pope, only the “kingdom of”. Ok thank you. Then could it be, perhaps, that she was lending a clue as to what is the TRUE nature of the Papacy? As in counter-revolutionary vs. revolutionary? We cannot know, but I’m pasting the relevant parts here for reference. It would make sense as for why the Popes were so frightened and why John Paul I in particular said he wanted nothing to do with the Vatican after speaking with Sr. Lucia. They were all frightened. Some mere assassination attempt doesn’t fit the bill. But we also have the words of Pius XII and others abotu reference to altering teh liturgy and the council, which are not contained here, so while some of this could possibly allude to it, it is not in fact the whole of the 3rd Secret. this one had the gaze of evil. it had a beak in the roof of the building. said to us: You saw the apostasy in the Church. destroyed and a new one built in Fatima. will be removed and transferred to Fatima. announced after Pius XII and before 1960.
abomination, the city will be destroyed. Our Lady told us that this is written, [in] Daniel 9:24-25 and Matthew 21:42-44. 25 “Know and understand this: From the time the word goes out to restore and rebuild Jerusalem until the Anointed One,[d] the ruler, comes, there will be seven ‘sevens,’ and sixty-two ‘sevens.’ It will be rebuilt with streets and a trench, but in times of trouble. It also explains why Sr. Lucia could not “physically” write down the 3rd secret without first having Our Blessed Mother appear to her to give her Heavenly assistance. It took Lucia 2 months or more to write down the 3rd secret. I always wondered what made this task so difficult? Do you have a reference to that comment you have above, Johnno? Interesting. And then he was killed.